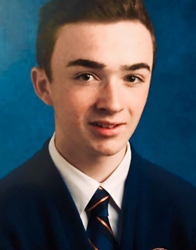 Colin Long, a sophomore at Roman Catholic High School and his classmate Derek Nguyen could have future careers maybe in statistical analysis or arbitration. 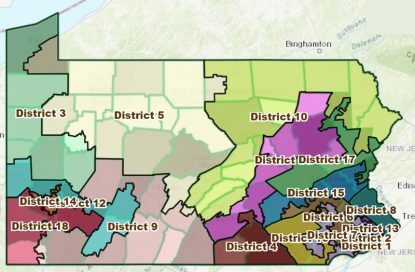 Recently the Committee of Seventy, a Philadelphia political watchdog group, ran a contest, “Draw the Lines PA.” High school students, college students and adults were invited to draw up hypothetical district lines for the 18 House of Representatives districts in the Commonwealth of Pennsylvania. Among high school students in the eastern third of the state, Colin’s entry took first place and Derek’s was runner up. Two other Roman students received honorable mention. Here’s why there is a district lines problem. In the 2016 general election Donald Trump nosed out Hillary Clinton in Pennsylvania 48.8 percent to 47.6 percent. Yet Republicans lost only five of the 18 House seats that year. This was caused mainly by gerrymandering, where the party in power retains control in the House by setting up district boundaries where they have a small majority in many districts and the other party has a large majority in a few districts and a minority in the rest, which skews the results. On the federal level gerrymandering only affects House of Representative races because presidential and Senate races are decided by statewide total, not by district. 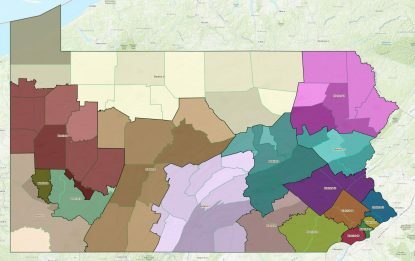 Since that election the Pennsylvania Supreme Court has mandated new district boundaries which, if they were in effect in 2016, the split would have probably seen more Democrats elected to the House, even though not all voters cast ballots strictly along party lines. The challenge for the contestants was to come up with a more elegant solution than that imposed by the court. Above is the former map of U.S. congressional districts in Pennsylvania, resulting in a much criticized process of gerrymandering. For example, each district should have approximately the same number of residents and it ideally should not have a convoluted shape; that is, closer to a square or a circle. 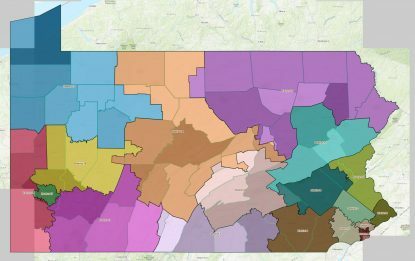 Above is the new, court-ordered map of U.S. congressional districts in Pennsylvania. Colin’s entry did exceptionally well in keeping the districts fairly equal in size. His largest district had only 1,598 people more than his smallest, at least according to the latest available figures. That’s about a quarter of one percent. But of course population numbers change as people move in and out of a given area. For purposes of the contest the state was divided into three sectors, East, Central and Western. It is Satullo’s hope that a meeting between area legislators and the young mapmakers can be arranged at Roman, because the legislators are responsible for drawing up future district maps that must be updated from time to time. The state Supreme Court only intervened because the last maps were so badly politicized. The winning entry of Colin Long in the “Draw the Lines PA” contest to draw up hypothetical lines for the 18 U.S. House of Representatives districts (color codes) in Pennsylvania. As for how he got started with the project, “I had government and politics classes with Mr. Corrigan, and he brought it up,” Colin explained. Working with his iPad and another computer, he actually came up with three different maps, each improving on the shortcomings of the previous. The proposed Pa. congressional district map (color coded) by Derek Nguyen a Roman Catholic sophomore lauded for his “Draw the Lines PA” contest. “I looked at the current map and thought it needed to change especially because some of the districts had many more people than others. I put a lot of work into making the population as evenly as possible,” he said. A real challenge was trying to make the different district’s races competitive. Colin accomplished this by using the spoke method. In the local area, for example, a district might start in heavily Democrat Philadelphia than extend out into the more Republican suburbs. Such a district tends to be long and narrow rather than compact. On the other hand, Derek, a member of Holy Innocents Parish in Philadelphia, took an opposite approach — he chose compactness over competitiveness. As for the future, Colin wouldn’t mind running for Congress himself someday. Derek is more cautious; whatever he envisions for the future, he keeps to himself. 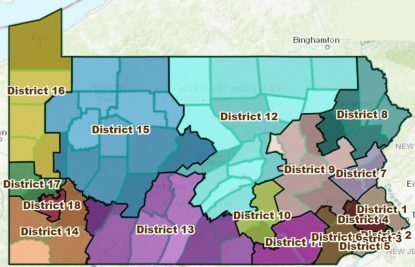 With that said, both Colin’s and Derek’s maps reflected the same conclusion: two of the 18 districts would probably elect a minority candidate for Congress, both from the Philadelphia area, and this also was the conclusion of the majority of 18 winners and runner ups in the competition based on the number of potential voters in each district. But in all of the maps, there was a much more even split between probable Democrat and Republican wins than is the case of the current map. The ideal map of course would result in a split between the parties in line of the percentages of the presidential vote of the year of the last presidential election. But as long as politicians have the last say on what the official map looks like, don’t hold your breath.